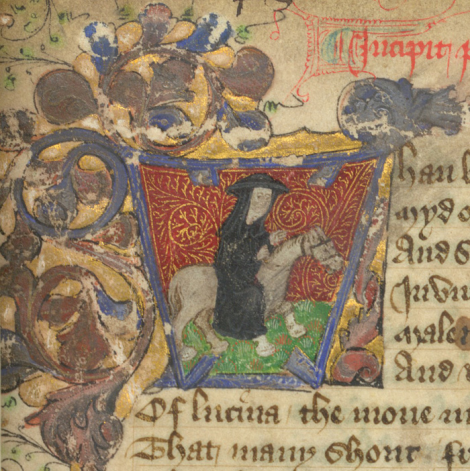 Detail of a miniature of the important 15th-century poet John Lydgate, the ‘monk of Bury’, riding to Canterbury as one of Chaucer’s pilgrims; from John Lydgate, The Siege of Thebes, England, 2nd quarter of the 15th century, Arundel MS 119, f. 1r. Religious patronage was one of the preferred means by which medieval queens expressed their power. To attract qualified men to enter her service, a queen needed to demonstrate the ability to reward their talent. The queen relied on the benefices which she could present to her clerks. A benefice was a permanent Church appointment, typically that of rector or vicar, for which property and income are provided in respect of pastoral duties. The ability to award these honors came from the churches on or near the Queen’s manors, whether held in wardship or in fee. When a Queen acquired a new manor, it was typical for them to include an advowson. This is a right of a patron (avowee) to present to the diocesan bishop a nominee for appointment to a vacant ecclesiastical benefice or church living. This process was known as “the right of presenting”. In some cases, these advowsons could be purchased separately from the acquisition of a manor. In this way, the Queen’s clerks would obtain positions in the churches. As of the date of this letter, the monastic cathedral of Christ’s Church at Canterbury held the advowson of All Saints, Lombard Street in London. Elizabeth of York had asked for and received a promise from the prior that she could appoint someone of her own choosing to the post. This letter is a simple request for a fulfillment of that promise. “To our Right Trusty and well beloved in God the prior of the monastery of Christ’s Church at Canterbury. Right Trusty and well beloved in God, we greet you well, and as we recently in other letter desired you to grant unto us the living of the parish church of All Saints in Lombard Street in my lord’s city of London, whenever it should fall vacant through the death of Sir Marques Husy, the late incumbent; whereupon it pleased you, out of your loving and kindly heart, to grant us freedom of the said benefice in writing, to nominate it for whichever of our chaplains we should choose at its next vacancy, for which we heartily thank you; we have been informed that it is now the case, the said Sir Marques being recently departed out of this transitory life into the mercy of God, so that the said benefice is now vacant. We therefore request and require you, that in honouring the said promise, you shall send us under your usual seal the giving of the said benefice, with a blank space on it, with the intention that we shall enter the name of whichever of our chaplains we shall think able and suitable to have charge of the curacy there. We sincerely trust that you will effect this desire of ours, whereby you will greatly deserve our special thanks, to be recalled in connection with any reasonable desires of your own concerning your well-being or that of your office in time to come. Given under our signet at my lord’s city of London the sixth day of June.